Generation Z currently makes up 24% of the global population and is set to have significant spending power. This "digitally native" population cohort, born between 1993 and 2007, will be a substantial customer base in the future. Emerging technologies are enabling powerful innovations by converging with other advanced innovative solutions to generate multi-billion dollar markets and growth opportunities across our world. At the core, technology convergence involves overlaying two or more emerging or existing technologies to create unique value propositions that could be commercialized. While each emerging technology on its own represents an area of intensified R&D, heightened investments, increased IP activity, and tremendous market potential, the possible convergence of several technologies opens up unprecedented opportunities for new revenue models and the next generation of innovative products and solutions. Frost & Sullivan invites you to join Rajiv Kumar, Senior Partner, TechVision, as he discusses the global innovation cycle and disruptive business opportunities in the webinar: Top 50 Emerging Technologies & Growth Opportunities. In the global economic and business environment, emerging markets have increasingly taken center stage in the growth strategies of businesses, with GDP growth rates across emerging markets outpacing that of developed economies. With accelerated middle-class expansion and a large and growing working-age population, investors are increasingly taking advantage of emerging markets. Moreover, prudent governance in emerging markets through the provision of state-of-the-art infrastructure and attractive doing-business measures also work as prime growth enablers. The concept of go-to emerging markets, however, is an ever-changing one in light of heightened volatility in the financial markets, looming geopolitical concerns, increasing competition, and changing business needs. To help companies develop a systematic and proactive approach to emerging market expansion, Frost & Sullivan developed the 2019 Emerging Markets List. • With the fall of the BRICS, which emerging markets should you focus on? • Identify go-to emerging markets based on a multi-dimensional approach that evaluates countries across six crucial pillars, including economic growth, business environment, and investment attractiveness. • Leverage country case studies on emerging market leaders and identify the success stories that propel these countries to the top. Concerns about continued crude price volatility and decline in consumption due to slowing economic growth across regions indicate more problems for oil companies as they scramble to maintain profits. As with any industry, when margins are affected, service providers take the hit and are forced to cut contract prices. To stay relevant and sustain growth, the oilfield OEMs and service providers have disrupted themselves by adopting broadly minded approaches to eliminate inefficiencies in operations and unlock new opportunities for operating companies. Frost & Sullivan invites you to join Isaac Premsingh, Industry Analyst, and Manmohan Singh, Senior Consultant, to gain expert insight on patent filing trends and top assignees in the measurement while drilling (MWD) technology landscape and technology trends, followed by an interactive, live question-and-answer session. • Learn how digital technologies can impact MWD and the initiatives that have laid the foundation for automated directional drilling. • What are the drilling efficiency improvements? • Hear about key ways to reduce the cost of service delivery. • Explore technology from sensors to software platforms that enable the digital transformation in MWD operations. The world economy is expected to enter a period of slowdown in 2019 amidst pressures from trade wars, higher interest rates, and emerging market capital outflows. Business in the US and China are expected to continue to face pressures from trade wars and are expected to deal with higher import costs by passing costs to consumers, relocating production, or pursuing layoffs. • Learn more about the 2019 GDP growth trajectory for key advanced and emerging economies. • Understand the key economic risks shaping the regions in which you operate. • Engage in an interactive Q&A session with Frost & Sullivan experts. From a customer perspective, selecting the right insurance policies through user-based insurance and demand insurance approaches will allow insurers to compete more effectively with powerful social groups such as the elderly and millennials, while prevention-as-a-service models will enable insurers to mitigate some of their most pressing threats to policy payouts. Insurtechs pose a threat to traditional insurers as they can avoid legacy systems and leverage new business models and technologies from inception. • Emerging insurance business models such as prevention-as-a-service, on-demand insurance, usage-based insurance, and value-added services will allow insurers to compete more effectively in this changing market. Sensors play a central role in a digital ecosystem, particularly the use of micro- and nano-sensors that can detect a host of biological, organic and inorganic substances, and communicate their detection to a smartphone or a communication system in real time. The ecosystem would enable a seamless digital world in which particulate matter, which could be potentially harmful, can be detected accurately and quickly. • Learn about the trends that are forcing a paradigm shift in personal and community health monitoring. • Hear about the latest innovations that are helping to create an immersive environment for non-intrusive, round-the-clock vital signs monitoring. • Identify challenges, bottlenecks, and barriers to the adoption and growth of the Internet of Medical Things and smart homes. Do you know what post-Brexit conditions could look like for your organization? The failure to strike a UK-EU agreement at the October Summit only increases the level of uncertainty, with the likelihood of a deal or no-deal scenario to become increasingly apparent by December. Across the globe and industries, there is a growing demand to replace steel and heavy metals such as copper and iron with lightweight alternatives. From medical devices and industrial components, to the automotive and aerospace segments, the goal is to produce lighter structures, increase energy efficiency and address environmental regulations. In addition, multifunctional metals that offer higher strength, insulation, and sustenance at higher temperatures are becoming additional prospects demanded by end industries. After three years of combat operations, the war against the Islamic State (ISIS) has ended, and the country is on the path of rebuilding and reformation. The country’s reconstruction, stabilization, and economic diversification efforts entail massive investment in all economic sectors, to the tune of more than USD 900 billion across multiple areas within the next decade. With a large youth population, vast natural and mineral resources as well as a strategic location, Iraq occupies a pivotal position in the Persian Gulf and Middle East region and has the potential to become a significant, cost-effective trading and distribution location. - Identify the most attractive sectors for investment and trade in Iraq. - Learn about the business environment, tax regime, available incentives and privileges for foreign companies. - Gain valuable insights about the current and future consumer market in Iraq. - Explore opportunities across multiple sectors, including oil & gas, food, medical, metal & minerals, energy & infrastructure, etc. The growth of IoT has transformed the way end users interact with machines (automotive, home appliances, etc.). The manufacturing industry is expected to witness a digital revolution with advancement in hybrid sensors, predictive analytics, wearables, digital twins, mass customization, 3D printing, edge computing, robots, asset monitoring, smart grids, and natural processing language. With IoT solutions predominantly focused on consumer applications, various companies and manufacturers are looking to adopt IoT to take advantage of attractive growth opportunities. Recent developments in precision agriculture solutions are facilitating crop yield data collection, nutrient management, satellite aerial imagery and development of variable rate technology, creating new opportunities for farmers across the globe. Emerging technologies such as vertical farming with LED indoor lighting systems and agricultural robotics are improving the quality of farm products and simultaneously stimulating the sustainability of crops. Water conservation advancements, enhanced-efficiency fertilizers, pest management and waste upcycling increase the yield per hectare of agricultural land by providing futuristic ideologies, which result in increased output and the conservation of the environment. · Learn about emerging technologies that will stimulate the future of agriculture through sustainable practices that use fewer primary resources as compared to conventional agricultural methods. · Discover new technologies, including equipment telematics, synthetic biology and LED light-based farming, which will increase yield per area of the agricultural field. · Identify the critical stakeholders and prospects, and find out the best practices in agriculture. The immersive technology market, including augmented and virtual reality, is expected to see massive growth in the next five years, and will mainly be derived by applications in manufacturing and simulation modeling. Advancements in technology like 5G, artificial intelligence, edge computing and robotics are expected to transform the augmented and virtual reality experiences. • Identify the critical sectors of the AR/VR market that have huge growth potential in the next 10 years. • Learn strategies to pursue technology convergence. • Gain knowledge about the future opportunities in sectors like media, gaming, telepresence, retail, medicine, and education. Rising congestion and pollution within cities have resulted in more emphasis on providing urban last-mile delivery solutions. Roughly 40% of the overall logistics costs are spent on the last mile. Demanding end consumers further aggravate the growing issue. Instant deliveries and user experience are critical value differentiators resulting in firms exploring new technologies and services to alleviate growing issues. New service solutions such as click and collect, locker boxes, and on-demand solutions are already underway for the last mile.The expansion of new services with autonomous solutions, such as delivery bot services, is driving market expansion and creating new growth opportunities. The past two decades have been characterized by tectonic shifts in the global economic and business environment, with emerging markets increasingly taking center stage in the growth and expansion plans of companies across the globe. GDP growth rates across emerging markets have largely outpaced those of developed economies, with accelerated growth enabling middle-class expansion, thereby creating growing demand for goods and services. • Learn more about 2018 emerging frontrunners, transforming emerging markets, and fledgling emerging markets, ranked using Frost & Sullivan’s proprietary indexing methodology. • Identify go-to emerging markets based on a multidimensional approach that evaluates countries across six crucial pillars, including business environment and investment attractiveness, amongst others. • Leverage country case studies on emerging market leaders and identify the distinct advantages that propel these countries to the top. Chinese entities are aggressively innovating in areas such as artificial intelligence (AI), robotics, supercomputing, quantum technologies, and genomics. Governments, policymakers and multinational corporations outside of China face challenges competing with the Chinese advancements as well as opportunities to level the playing field. • Where does China stand on various innovation indices globally? • What does China’s considerable growth in its innovation ranking mean for other leading economies and companies that have business interests in China? • Which policy initiatives were taken by the Chinese government resulted in improving the innovation ecosystem? Frost & Sullivan's Emerging Market Innovation webcasts are useful for both reactive companies that are new to a country or market, and proactive companies that stay in step with the changing scenarios. Our Emerging Market Growth Monitor, Global Economic Tracker-Insights and Trends (GET-IT) offer demographic, socio-metric, economic, political, and regulatory research by industry and region. 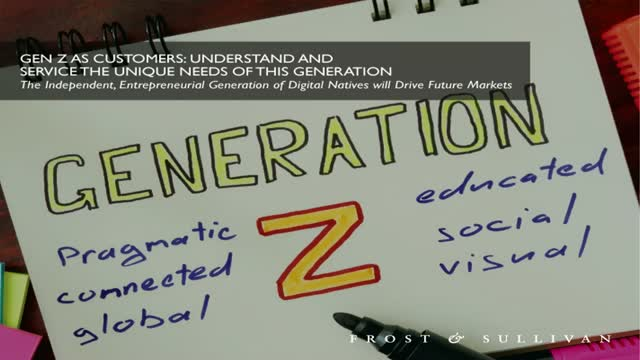 Frost & Sullivan’s Mega Trends research webinars provide identification and analysis of the most important global Mega Trends within and across industries, potential scenarios of specific trends through 2020, and the implications of those trends in transforming business markets, society and cultures. Our services enable companies to develop and implement a macro-to-micro analysis process to integrate Mega Trend knowledge into actionable strategy.